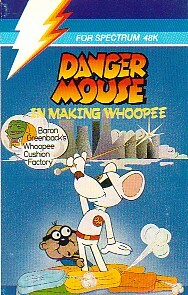 Danger Mouse in Making Whoopee is an action game that was released by Creative Sparks for the Sinclair ZX Spectrum and Amstrad CPC in 1985 (and designed by Phil Snell); it is the third, and final, title in their Danger Mouse series, and is once again based on that Cosgrove-Hall/Thames Television series of the same name. However, at some point after this, a Danger Mouse game was released for the Commodore Amiga by an unknown publisher - but despite featuring the voice of Sir David Jason, Myfanwy Talog (1944-1995) and Terry Scott (1926-1994), it was a "knock-off" of Century Electronics' 1983 arcade title, Hunchback, and as a result, is almost as maligned as Alternative Software's Count Duckula 2 (the ZX version of which was named the "Number One Worst Speccy Game Of All Time"). There would not be another Danger Mouse game until the release of Danger Mouse: Quiz for iOS, in 2010; eighteen years after Danger Mouse had made his final ITV appearance, on Bunglers in Crime. This page was last edited on 31 May 2015, at 16:16.